When his friend asks Apu (Soumitra Chattopadhyay) the reason of his detachment from his child Kajal, Apu makes the rather blunt statement above. In the last film of the Apu trilogy based on a Bhubuti Bhusan Bandopadhyay novel, ‘Apur Sansar,’ Ray visually and tellingly captures the grief that Apu experiences on losing his wife Aparna (Sharmila Tagore) prematurely. His deep love for his wife made Apu lose interest in life, and he aimlessly drifts from one place to another. Meanwhile, his son grows up as a mischievous boy and lives with his grandparents back in the village. After a long persuasion by his friend, Apu visits his son. After the initial resistance (Kajal throws a pebble towards Apu), a bond develops in the father-son relationship. The final shot of Apu carrying his son on his shoulder is a reaffirmation that life doesn’t always end with grave personal tragedies, and must continue for the sake of the future generation. The film is rich in visual imagery, and the dialogue is sparse. A particular scene in the film where Apu slaps his brother-in-law Murari when he breaks the news of the death of Aparna to him has been widely disputed. The slap is not in the novel. It found an echo in some reviews. The Hindustan Standard Critic claimed: “The whole incident too will appear shocking to many, as it runs counter to the author’s original conception of the character. In this connection it may also be mentioned that other deviations from Bhubuti Bhusan Bannerjee’s novel have hardly improved the film.” Virtually the same words appear in the Bengali language newspaper Ananda Bazar Patrika. Probably the most remarkable reaction to Apur Sansar was that of James Powers, reviewing the film for the tough Hollywood Reporter. He said: “It is good for Hollywood to see a film of this sort and of this success. Made with little more than a camera and imagination, it is a reminder that our great technical improvements are often priceless assets. 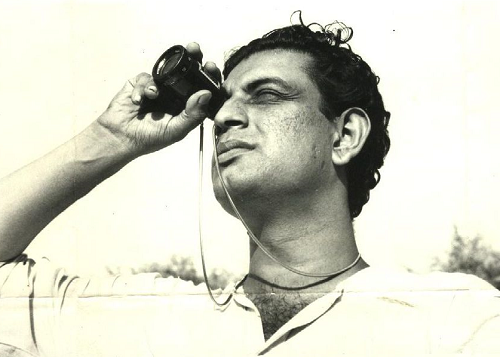 It is a reminder also that they should remain assets, not to be treated as fundamentals, and that the chief ingredient of any film is still the intangible genius of its maker.” (Marie Seton, Portrait of a Director: Satyajit Ray, 139, Dobson).